Connie Rieper-Estes likes to name her goat babies in batches. There are the cookie goats: Snickerdoodle, Biscotti, Nutter Butter, and Black and White Cookie. Before them came the ice cream-themed names: Neopolitan and Caramel Sundae. What better names to give a bunch of hungry goats? But Rieper-Estes’ goats are more than your average grazers. The so-called Greedy Goats of Northwest Arkansas are a group of 20 whose job it is to travel around the city of Fayetteville, Arkansas, and eat invasive species. In Northwest Arkansas, that mostly includes bush honeysuckle and Chinese privet, the goats’ favorites. Rieper-Estes launched this business in 2015 after her initial three-goat herd began to multiply. She knew goats were effective at clearing brush and shrubs. (After all, she bought her first three to help clear blackberries from her property.) Out West, goats have become a popular fire suppression tool because they reduce the amount of natural fuel-like shrubs that help wildfire spread. To give you an idea of how in-demand goats have become for all sorts of purposes, HireGoats.com lists “goat service professionals” from around the country. Still, it took Rieper-Estes some further research before realizing that her hungry friends could be a sustainable solution to removing invasive plants. They eliminate the need for toxic chemicals and energy-guzzling machinery that are often used to kill and remove plants. The goats also help fertilize the land with their droppings. In Arkansas, the invasive species the goats like to eat can be especially detrimental because there’s no natural shrub layer in the state’s forests to compete with them, said Travis Marsico, the interim chair of Arkansas State University’s biology department. Their existence means fewer resources to sustain native plants on which local wildlife rely. The presence of Chinese privet, in particular, has been linked to slower canopy tree growth and potentially even tree decline and death. Luckily for native species like Virginia creeper and dogwood, this part of Arkansas has got goats on its side. Because goats don’t really eat stems, stalks, or roots, they’re not a one-and-done method of removing invasives. They are, however, an effective first step. Afterward, people must come in to finish the job and remove what’s left. that are poisonous to goats, like azaleas. Then, they put up an electric fence that’ll surround the goats. Once it’s time to eat, Rieper-Estes takes about a dozen goats that voluntarily enter a minivan that transports them to the job site. “There are a couple goats that never go,” she giggles. 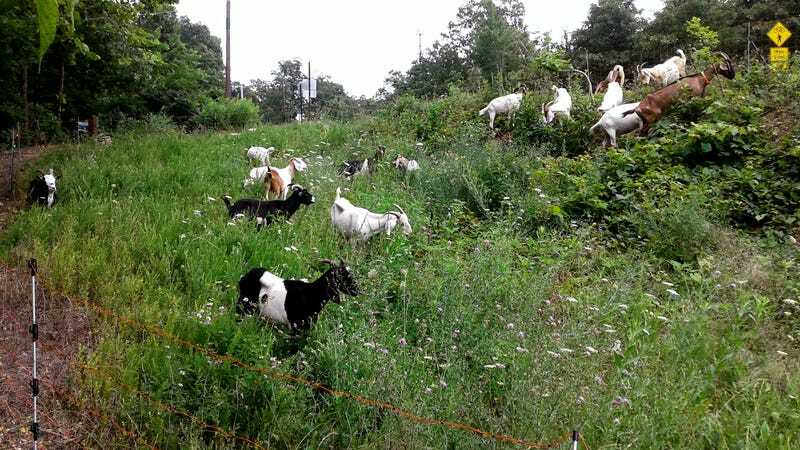 Greedy Goats now partners with the City of Fayetteville to remove invasive plants from Wilson Park every year. This was actually the goats’ first invasive-fighting gig in 2015, and it’s continued every year ever since. The goats have gone on to munch on nasty invasives for private homeowners and the University of Arkansas. Goats as a weapon against invasive species are catching on around the U.S. There’s the Munch Bunch serving the Twin Cities and western Wisconsin that’s been around since 2015. 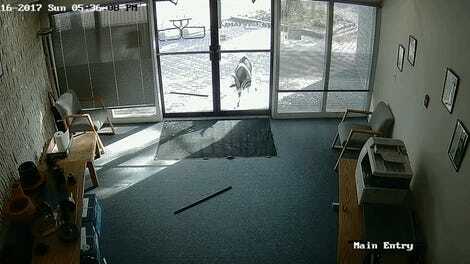 In Maryland, Eco-Goats can come to the rescue. And for Greedy Goats, the work is just beginning. The goats will be back at the University of Arkansas next year to help clear out invasives again. With faces like these, who couldn’t love greedy goats?